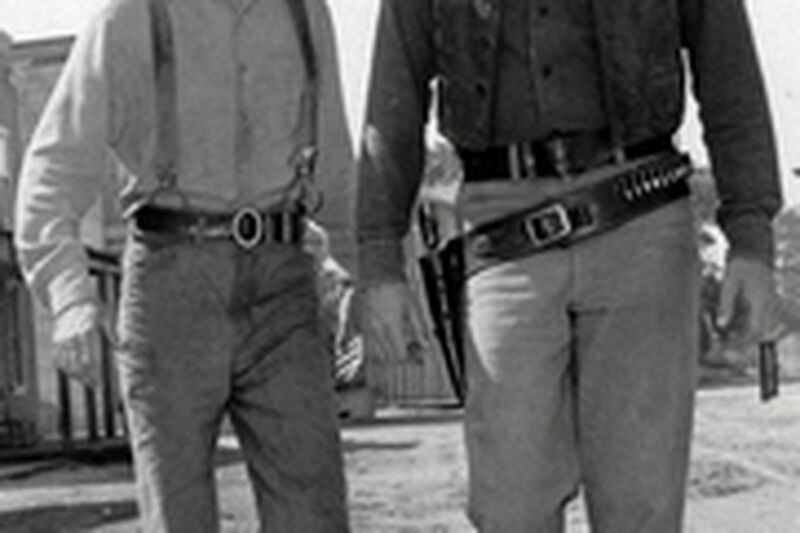 Marshal Matt Dillon (right) , played by James Arness, lasted a mere 20 years. Dennis Weaver was his sidekick in "Gunsmoke." Gunsmoke ran from 1955 to 1975. This column ran from 1982 until today. Marshal Dillon is being transferred out of Dodge. Sadly, the economic realities of the newspaper business are such that the staff of The Inquirer, my journalistic home for 27 years, has been hard hit by layoffs and buyouts. We no longer have the bodies to cover every beat as we did in the past. To this reporter, it means The Inquirer doesn't have the luxury of a daily, staff-written column about TV. Other areas are hurting, too, and their need for reporters is even more dire. Think of it as a media ER. All emergencies are important, but they must be triaged by immediacy and threat to life. Eventually, everyone is treated, but not always in a timely fashion or by the physician of her choice. I will still cover TV, albeit not in column form or on a day-to-day basis. Though I'll do more feature stories about popular "water cooler" shows, I will not - repeat not - abandon TV news. The network news divisions, all-news cable networks and "big picture" coverage of the industry are all important and will continue to be in the mix. Given the unprecedented churn of the evening-news landscape over the last few years, I suspect that will happen with some frequency. In TV terms (what else is there? ), my show isn't being cancelled. It's moving to a new timeslot. I can't complain, really. Twenty-five years is a spectacular run for any series in a medium with the lowest boredom threshold known to humankind. Consider: In 1982, there was a smattering of cable channels, most of them low-budget. Today, the average U.S. home receives more than 110, and they carry some of TV's most prestigious programming. In 1982, CNN was two years old, and Katie Couric worked there as a fledgling correspondent. MSNBC and Fox News Channel wouldn't launch for another 14 years. CBS's 60 Minutes and Dallas were the most popular shows. Cheers, Family Ties and St. Elsewhere, all on NBC, were the hot newcomers. Vanna White had just started turning letters on Wheel of Fortune. David Letterman was breaking into the bigs as host of NBC's Late Night. On the evening news front, ABC was anchored by Peter Jennings in London; Frank Reynolds in Washington and Max Robinson in Chicago. At NBC, Tom Brokaw and Roger Mudd alternated after John Chancellor stepped down. Dan Rather had recently succeeded Walter Cronkite on CBS Evening News. Oh, and Ronald Reagan was in his first term, "Bette Davis Eyes" topped the charts, Pelle Lindbergh was minding the net for the Flyers and we lost our own princess, Grace Kelly, in a car crash at age 52. When I joke that "TV is my life," it's not far from the truth. I've watched the TV universe explode from three broadcast networks viewed only in a console to an avalanche of cable channels transmitted to every imaginable platform, seen on demand. And the technology is in its infancy. Along the way, I'm privileged to have known authentic legends like David Brinkley, Walter Cronkite, Barbara Walters, Roone Arledge, Linda Ellerbee and Don Hewitt, as well as Rather, Brokaw and Jennings, among many, many others. The one constant has been the loyal readers of this column. I have never taken you for granted, and I never will. My mission - to serve you - has not changed. It will just appear irregularly and in a different form. I have only one request. Stay with me.